It is not until the very end of Calls Will Be Recorded For Training And Monitoring Purposes (Optimologyº, £19.95) that any explanation of the 172-page, small-format book is given, writes Hannah Ellis. A single line states that the book is ‘an oblique study in words and pictures of society, culture and the power of language.’ But to most readers, this will have become obvious by that point. Through her images, designer and author Penny Hartley points out the inescapable weirdness of Western society, unpicking and critiquing norms through meme-like graphic images, manipulated photos and nonsensical diagrams. 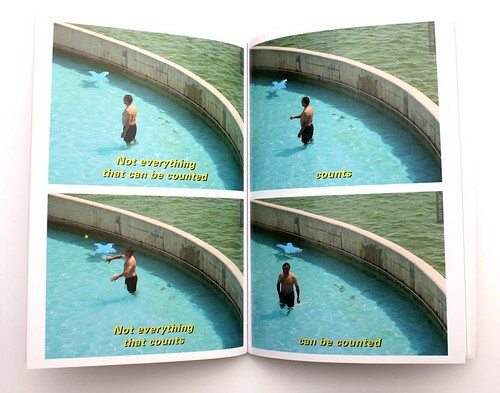 Spread that makes use of ‘meme’ imagery of text over panelled images. From Calls Will Be Recorded For Training And Monitoring Purposes, the latest publication from Penny Hartley’s Optimologyº, with photographs by David Hartley. 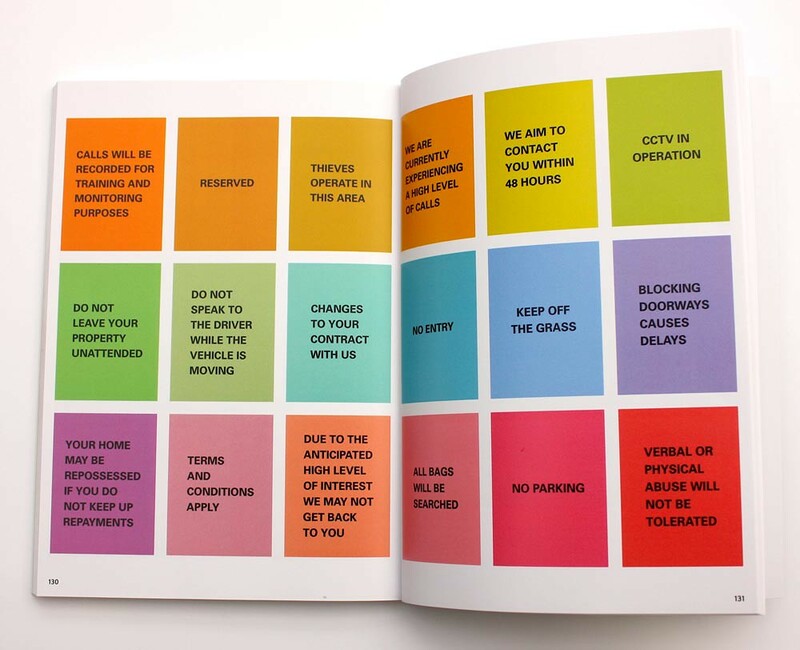 Top: Authoritative messages are printed plainly on coloured panels, including the one after which the book is named. Much of the work of Optimologyº has already been published, either on optimology.org, as posts on the @optimology Instagram account or in the handful of saddle-stitched booklets shown in Noted #79 on the Eye blog (link below). The work has an immediacy that is often lost within explanation-heavy critical design. 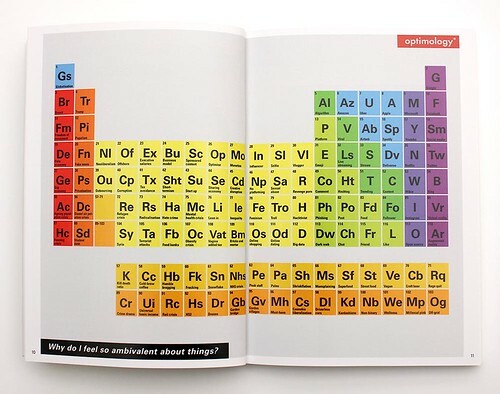 One image, a ‘periodic table’ of a social sciences labelled ‘Why do I feel so ambivalent about things?’, charts the elemental building blocks of neoliberalism, starting with Globalisation (Gs) and moving onto the Kardashians (Kd), Instagram (I) and Mental Health Crisis (Mc). Another image, ‘I must try not to judge by appearances’, uses the visual languages of four consumer goods to skewer graphic design’s role in codifying value. Hartley lays out the ‘elements’ of neoliberalism in a periodic table pastiche. Each of the pieces is sort-of designed, sort-of vernacular. They can be a bit awkward sometimes, but in a way that makes Hartley’s points accessible and believable. They are spared the layers of personal stylistic choices that can so often obscure critically intended messages. As most of the content already exists for free online, existing followers of Optimologyº may not gain a huge number of new insights from this book. Calls Will be Recorded for Training and Monitoring Purposes feels more like a printed record of social media accounts, in which the visual language of Optimologyº’s digital platforms is documented in a format with greater longevity. The publication seems to be preparing for social media to wane and eventually become obsolete. Facebook, Twitter and so on are all products of the ‘unfettered neoliberalism’ criticised by Hartley. 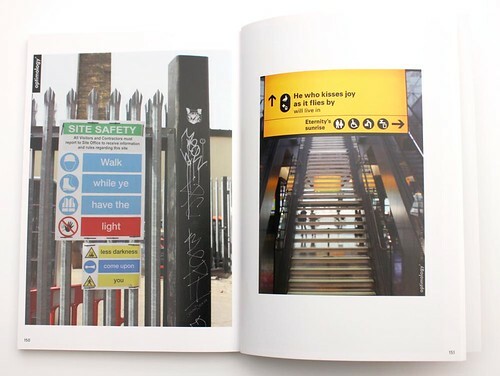 Hartley manipulates public signs, including safety warnings and airport signs, in a manner reminiscent of Adbusters. 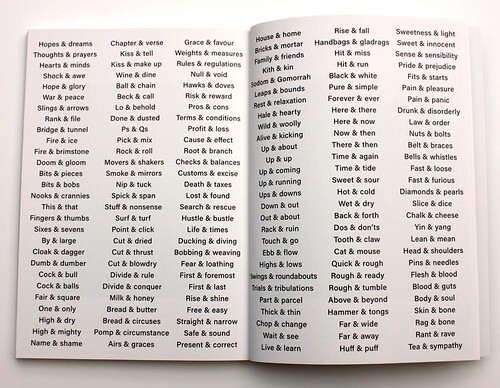 Idioms and clichés that contain ampersands. Preserving digital insights as hard copy has its challenges; there are points where the razor-like insights of the images sit uncomfortably within the traditional format of a book. The effects of neoliberalism upon publishing are not explicitly acknowledged But perhaps the marketisation of already-free content is actually the perfect critique in itself, a subtle sideways-glance, as accessible and believable as the content within. Optimologyº, Calls Will Be Recorded For Training And Monitoring Purposes, £19.95 + p&p. Buy from Optimology.org.